Time sure flies. 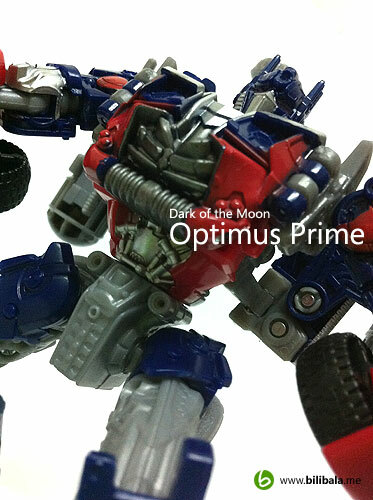 The official launching of the Transformers: Dark of the Moon toys is just another 3 days away! Have you get ready your bullets (ahem, money) for them? Well, guess there are a bunch of them in wave 1 which are definitely on top of my shopping cart list (which are being listed in my earlier post of the Dark of the Moon wishlist here). It will be a crazy shopping spree for me this coming Saturday morning as I am planning to get most of them as soon as they have released on the shelves! 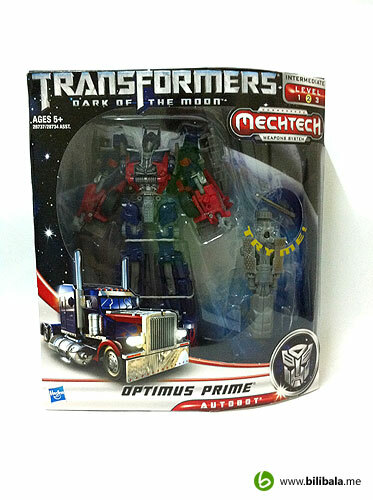 Anyhow, before we go further with the suspense of waiting for the official launching, let’s carry on with my sharing on my last piece of the earlier Dark of the Moon toy collection: the voyager class Optimus Prime! I guess i have no need of doing much explanation on the character background of him. 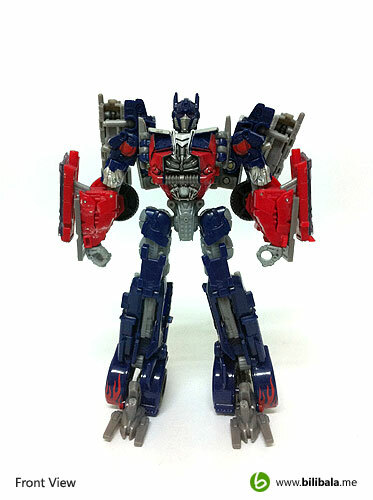 Everyone knows Optimus Prime, i assumed :p Let’s just skip on this and move on with the features of the toy. Well, for those who have been following my sharing on Skyhammer and Megatron will definitely not be a stranger to this type of packaging. Nothing much to highlight about here and you pretty much can see the standard layout and the “Try Me” hole there. 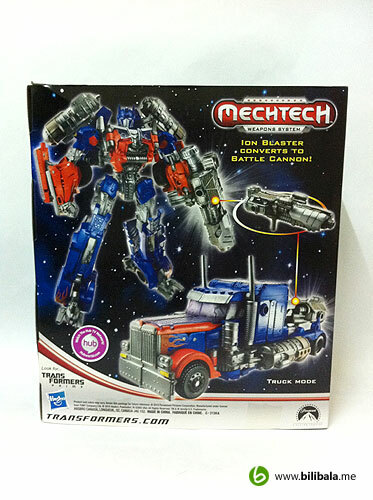 Again, the “Try Me” hole is for those newcomers to get a hands on 1st experience on the new gimmick: Mech Tech and please don’t expect to see glowing lights or sound like in the all the previous Transformer Movie packaging. Is purely mechanical gimmick this time around. 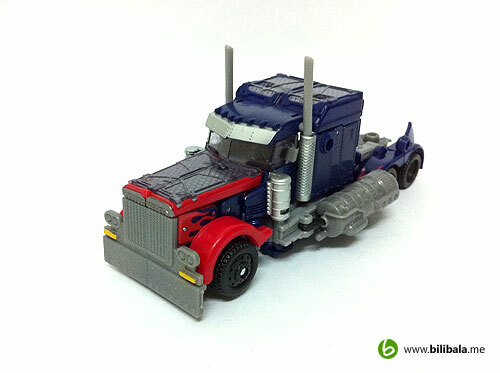 Well, Hasbro did retain most of the look and feel for the new voyager Optimus Prime alternate mode: same great colors, fiery decals, etc. 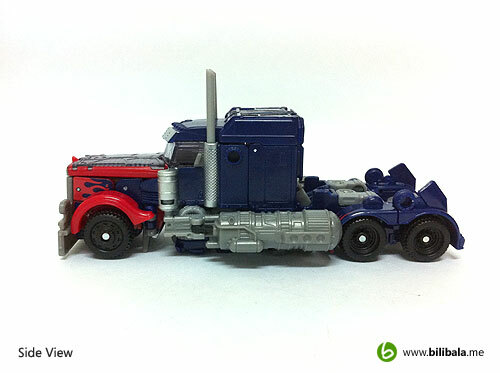 Can’t really expect much as it is quite impossible to have a different truck design for Optimus Prime in the movie though. What Hasbro has done to “enhance” the new look is by adding some details to it. And what you will be seeing in the movie, Optimus prime will have a long trailer attached to him and sadly, this voyager does not come with the trailer. 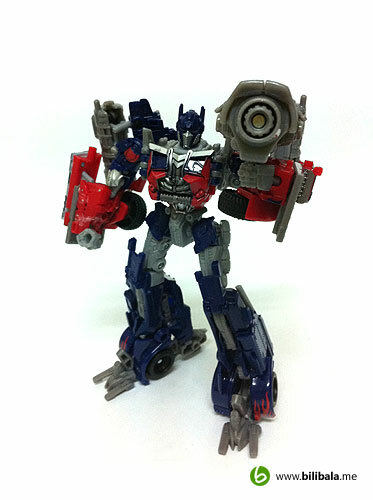 However, there is news that the Takara version of the voyager Optimus Prime will come with one. 🙂 So for those who are want to get the trailer as well, waiting a little while longer will definitely worth it. In my opinion, i don’t much like the over-sized gas tank located at the sides of the truck. Quite obvious from the front view below. 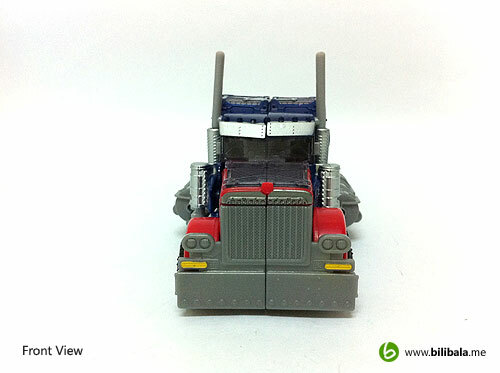 The coloring for the alternate mode is quite nicely done with silver metallic color seen in several parts of the truck such as the truck exhaust pipe, etc. However, there’s a weird spot of coloring which i can’t really accept, i.e. the front grill coloring. Notice that the upper part of the grill (separated by the gap) is of darker, metallic silver while the rest of the grill goes with the light, unpainted grey color. 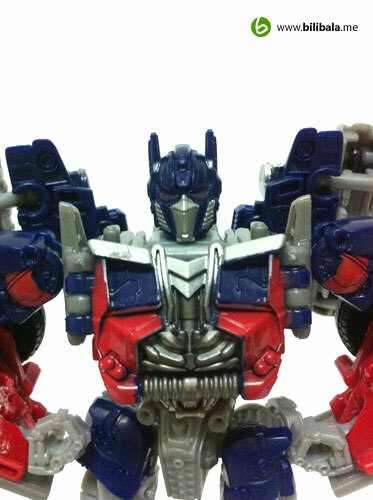 This is quite obvious if you see the actual toy itself and this is kind of weird combination of coloring anyhow. Moreover, there is NO color for the Autobot insignia located on top of the grill. Yes, is just plain red color from the plastic and not a single coloring has been done to highlight the insignia. You can’t even make out of the Autobot sign if from far. Sadly. But do remember that this model i have here is of the earlier batch of leak production and might or might not be the final mass production which you might expect the colors to be improved. Let’s just hope this isn’t the final production and aim for a better color on these smaller details. From the side profile of the truck, you will notice that there are no silver metallic color on the rims. Just plain black which somehow reduces points on the details. And not to mention, the oversized gas tank here is abruptly designed which doesn’t fancy me as well. From here you can see there is a trailer insertion port (which is also a Mech Tech port) whereby you can plug in your Mech Tech weapon here as weapon storage (for the time being). From the top part, you will definitely notice the oversized gas tank which is not in line with the rest of the parts. This might be a “Turbo” gas tank or jet pack for the robot mode, but the size of it does overall create a strange imbalance on the alternate mode IMHO. 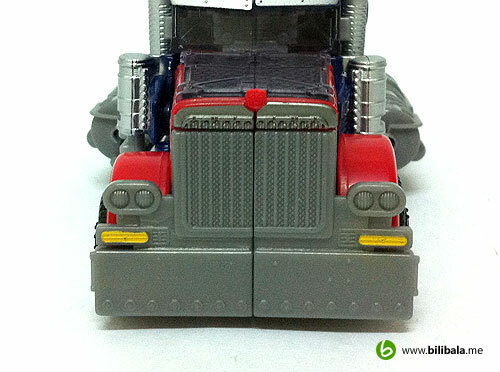 Anyhow, i have seen Hasbro has taken another approach in beautifying the old Optimus Prime with funky, carbon texture like plastic on the body of the truck. 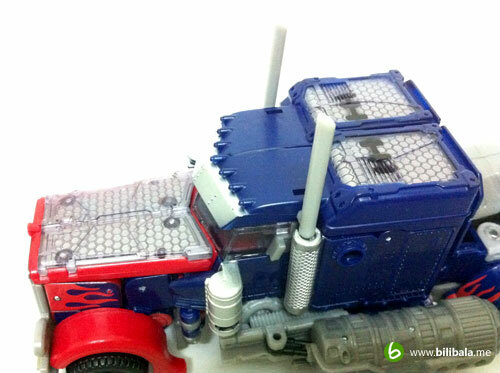 This does boost some new look for Optimus Prime. 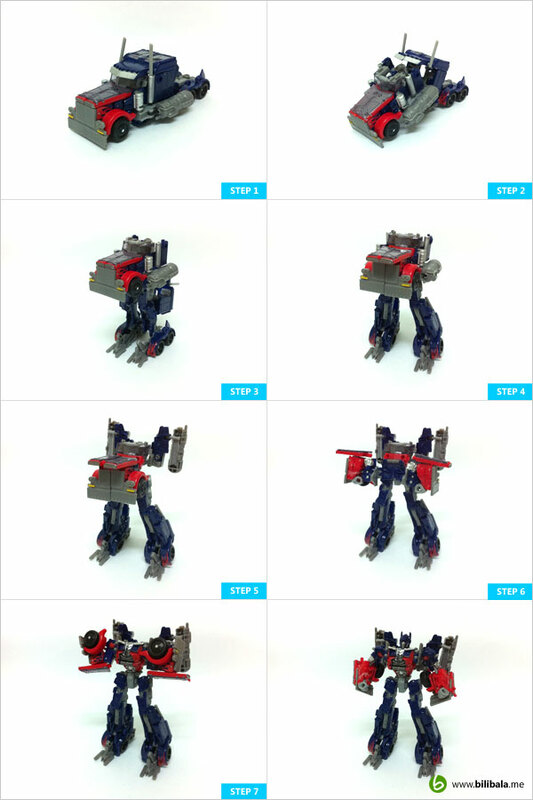 Some closed up shots on the details/colorings of the alternate mode here. The nicely done silver metallic painting (not chrome) on these parts of the truck does treat as an eye candy for the toy. Notice that the windscreen is a translucent dark grey plastic with those carbon texture as well. The funky, carbon texture plastic being used. 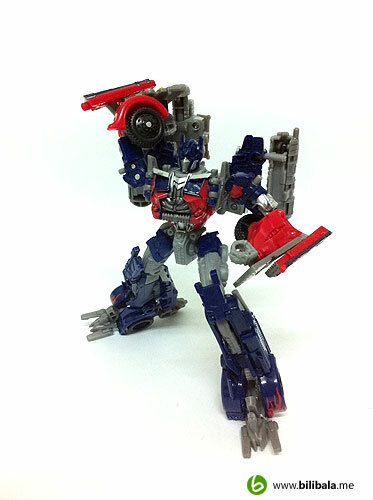 The robot mode for Optimus Prime stands confidently and does have a heroic posture all together. The overall weight distribution is nicely done and the proportion isn’t that bad as well, though the upper body seem noticeable shorter (& bulkier with the 2 over-sized jet pack/gas tank) than the lower part. The articulation for him is pretty standard and with the extra waist joint, additional flexibility of posture also can be done. Notice how big size the base of the leg is, this acts as a strong support to the upper body and definitely you can stand him firmly on ground with much ease. 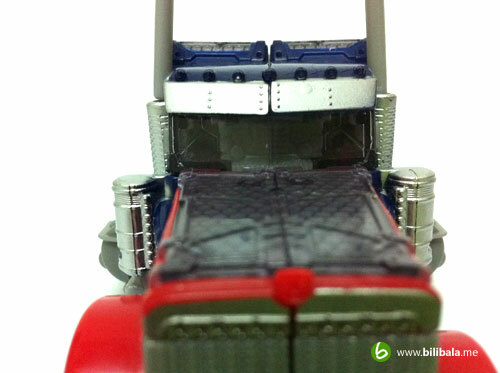 The 2 gas tanks are actually the “Jet pack” for the Optimus Prime. 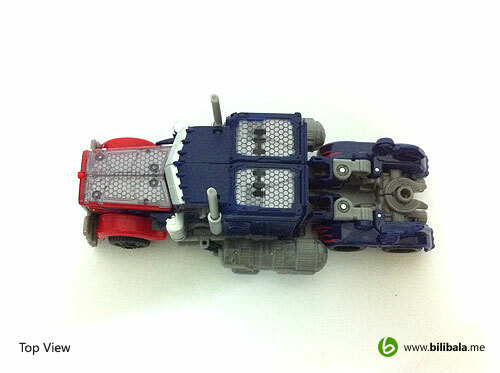 A closed up on how the new Optimus Prime will look like. The eye pieces are of shady dark grey color plastic. Notice the coloring for the chest area. They are using dark silver metallic colors for it. Nicely done and it is what i like most about the figure! Transformation is of intermediate. 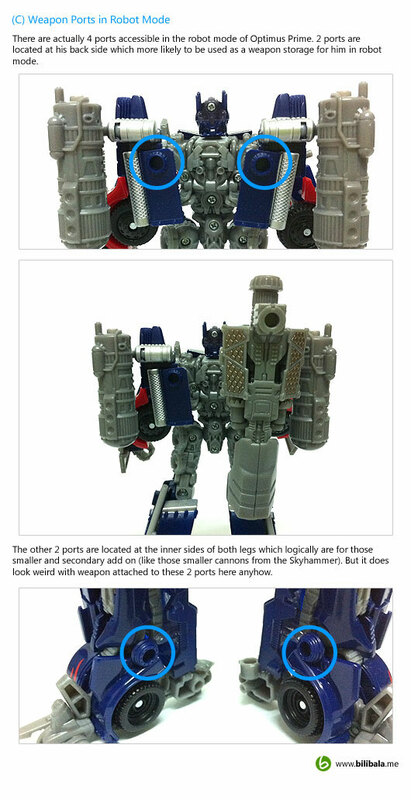 Personally i feel that the transformation is much more simpler and not that involving as compared to the Skyhammer and Megatron. Here are some poses i manage to snap him with. 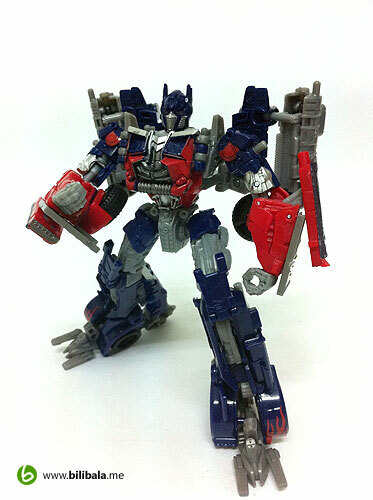 Overall, nothing much on the new Optimus Prime that will bring WOW effect to me. 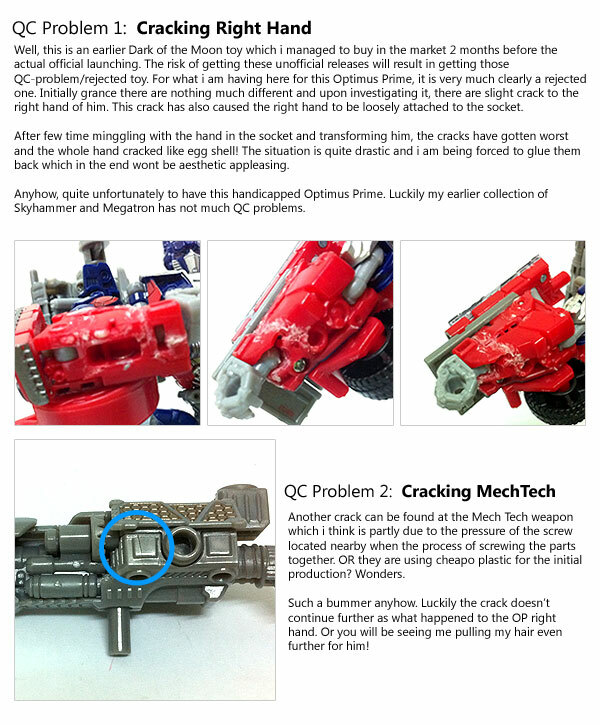 And the experience of the QC problem does really spoil further as being one of my collection. Well, you can’t really expect much from an UNOFFICIAL release of toys with cheap price tag anyhow. 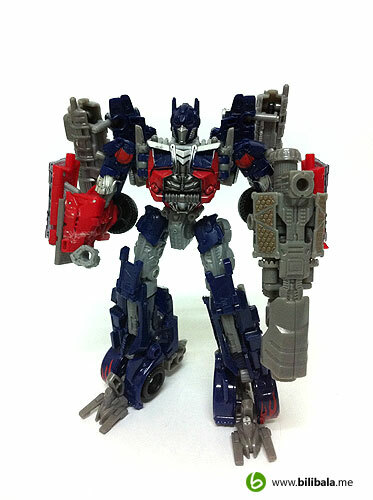 My hope is, the final official release will not have all these QC problems and this will definitely add much more points of collecting the Optimus Prime. Anyhow, my PCR for him will be 4.5/10. Very much low mark for my collection since it is spoiled with broken right hand. Geezz…..
Until then, better grab from Hasbro official release this coming Saturday if you are interested! Just 3 days way! Yeah! 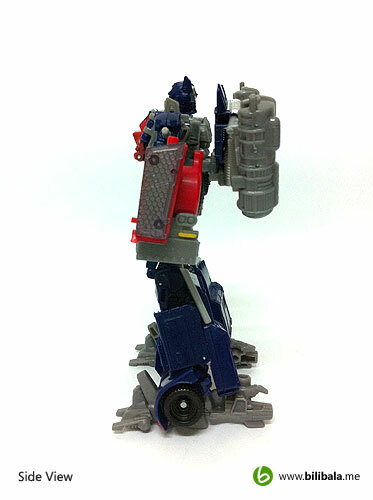 Or better still, just wait for the Takara release (with trailer attached)! 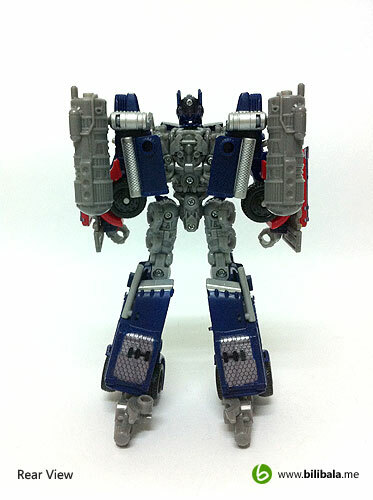 Interested in seeing the takara version? Here’s a link! 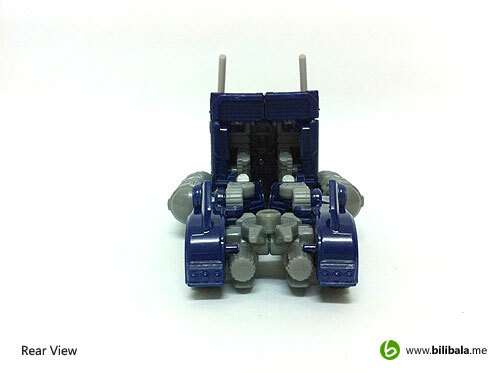 And the great thing about the takara version is, they make the gas tank smaller! What a bliss!